Family Guy - This new game from Take-Twos 2K Games will introduce the Griffins to gamers everywhere. In the game, being developed as a third person action/adventure, players will take on the role of multiple characters such as Stewie, Brian the Dog, and Peter, the hapless patriarch, as they interact with many of the citizens of Quahog. The Family Guy is the latest arcade game from Take2 Interactive that features the wonderfully dysfunctional Griffen family in their most exciting adventure to date. well, in the world of games anyway. Dubbed "too hot" for television, the game features many locales and characters from the animated series that the follows three storylines. One story pits Stewie against brother and arch-nemesis Bertram, another allows players to control Peter in an attempt to stop his boss Mr. Belevdere from taking over the world and finally Brian, the Griffen's pet dog that is probably the most entertaining story of them all where our loveable canine must escape prison in order to prove his innocence in a puppy parental case gone bad. 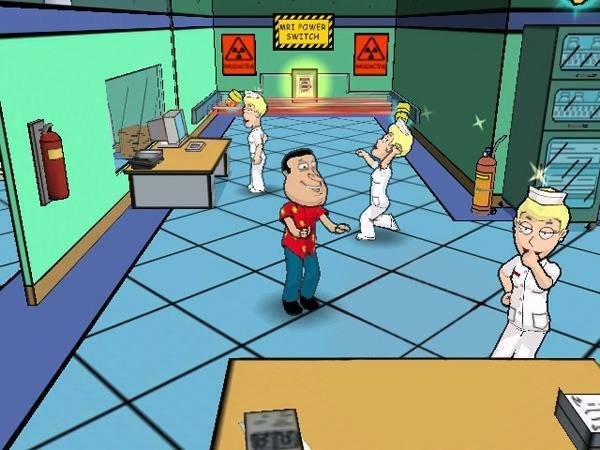 The PSP version of the Family Guy features your traditional arcade style of gameplay where the player must jump, run and fight their way through the Family Guy universe in order to solve clues, puzzles and missions in some extremely comedic moments. Fortunately for those new to the world of arcade gaming or the PSP is a tutorial level that teaches the player how to move through the gaming world with Stewie, the baby of the Grifen family. 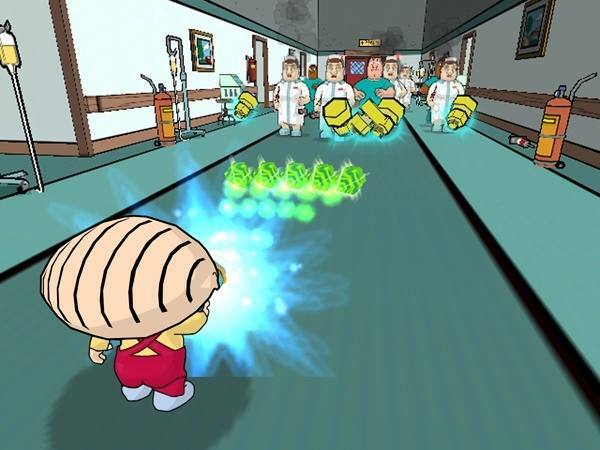 In this level, Stewie must collect 20 pieces of his ray gun in order to not only "kill" his mother (which he tries in almost every episode) but also challenge and defeat the local neighbourhood brain, Bertram. This level as does the majority of the game involve a variety of jumping in order to get to unreachable places that does become a little frustrating. This becomes prevalent on the second level where Stewie must jump all the way up on a giant microscope and one wrong move and you need to start all over again. Fortunately Stewie has four balloons that he uses to glide which all members of the Griffen family have some special ability. With that said, the game is extremely reminiscent of the Simpsons arcade game that was released almost 20 years ago and needless to say, this was quite an entertaining game. The Family Guy also fits this genre and in the world of first person shooters and racing games, it's nice to see a game go back to an almost forgotten genre of arcade madness. Unfortunately the repetitiveness and frustration of the levels does become annoying and what should have been a fun romp through the town of Quahog, sometimes make you want to throw the PSP out a window. It's a mixed bag that what should have been an awesome game is only a mediocre game. Graphically, the Family Guy is a visual treat on the PSP that looks almost identical to the television show with locales and characters virtually identical. The developers have done a great job at recreating the town of Quahog. Although as the TV series, the game looks 2D, it uses 3D characters and 3D objects to give the effect of a three dimensional space. The colour palette of the Family Guy is quite vivid and bright and match that with a variety of special effects and it's easy to be drawn into the world of the Family Guy. In conclusion, the Family Guy is unfortunately a hit and miss game that fans of the series will probably enjoy for a little amount of time, unfortunately the repetitiveness nature of the gameplay will hamper your enjoy.